Could one fall in love with a girl in a drawing? That’s the question I asked myself when a sketch of a young woman standing in a crowded subway carriage caught my eye. 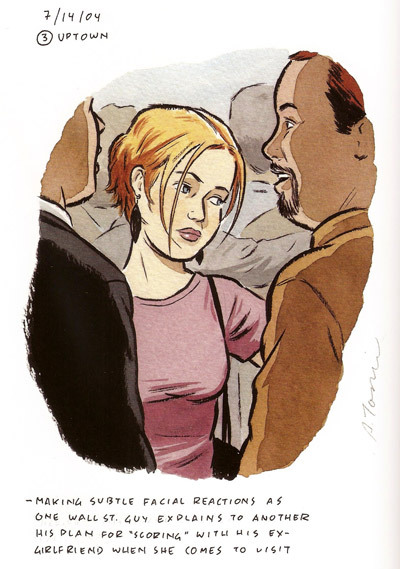 She is framed by two Wall Street guys and can’t help overhearing one of them explaining his plan for scoring with his ex-girlfriend when she comes to visit, but I only know this last bit because the notes under the sketch tell me so. Just looking at the woman’s contemplating face, she could be thinking about anything, her mind floating somewhere far away from her mundane surroundings. It’s a striking portrait of a very attractive woman whose beauty has a natural girl-next-door quality. And with that last sentence I guess I just answered my own question. Yes, one can fall in love with a girl in a drawing, especially when the artist conveys some of her aura and at the same time leaves enough to one’s imagination to fill in the blanks with one’s own romantic musings. 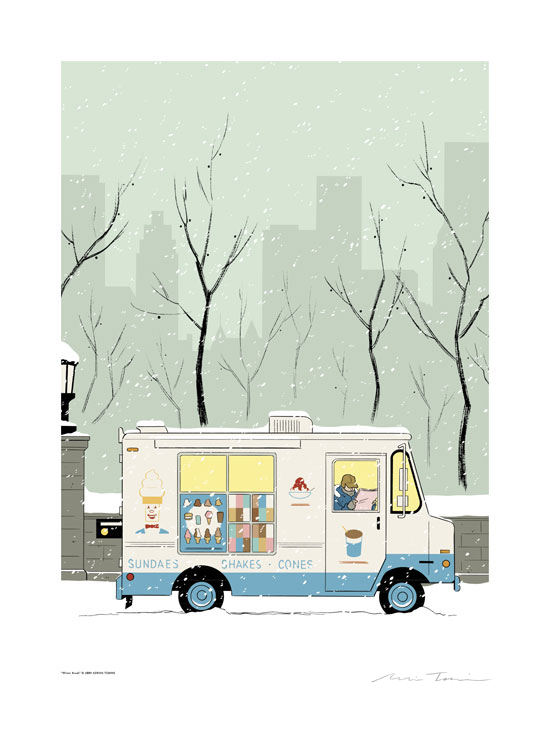 The portrait is printed in New York Drawings, a wonderful collection of Adrian Tomine’s illustrations, covers and comics for The New Yorker magazine, and other illustrations inspired by the Big Apple, such as album covers, book jackets and sketches. Comic book artist and illustrator Tomine (Sacramento, 1974) moved from California to New York in 2004. He acquainted himself with his unfamiliar surroundings by compulsively drawing the people around him. ‘I started doing a lot of very quick, observational drawing in sketchbooks. I think I was looking for a reprieve from the rigid drawing style of the book I was working on at the time [Shortcomings], and I was also just spending a lot of time exploring the city on my own, and sketching was a way for me to still feel somewhat productive in the process,’ Tomine explains in the book. The illustrations are accompanied by the original publication date. Their titles are derived from the original article with which they originally paired in The New Yorker. The notes at the back of the book explain the image’s background, but I prefer to read the illustrations without them, so I can make up my own story about what the image conveys. 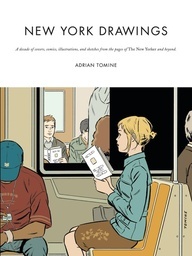 Tomine’s art and especially his clean-line style look similar to the likes of Daniel Clowes and Chris Ware. 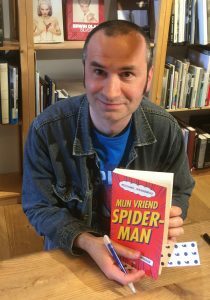 In an interview with The Comics Journal #205 Tomine mentioned Clowes and Jaime Hernandez as being major influences on his work. Although I love the stillness of his illustration-work, I have a slight preference towards Tomine’s sketches, which naturally have more spontaneous line-work and lively hand colouring, as opposed to the Photoshop-like colouring of the commissioned illustrations. Funnily enough, the book opens with a comic strip about Tomine’s first Christmas party hosted by The New Yorker. 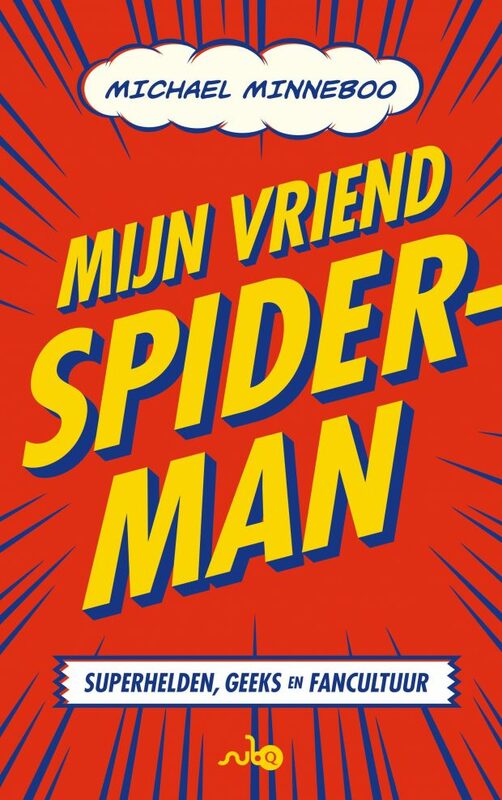 Typically for his comic book persona the artist presents himself as an introverted, somewhat neurotic newcomer, feeling out of place at the high-class party attended by celebrities such as Steve Martin and Philip Roth. Trying to find a comfortable pose he asks random people where he can find a coat rack while he treats the reader to a neurotic internal dialogue, not deprived of self-mockery I might add, explaining how he got to work for The New Yorker in the first place. New York Drawings is an interesting way to see one of the greatest cities on earth through the eyes of a well-accomplished draughtsman.